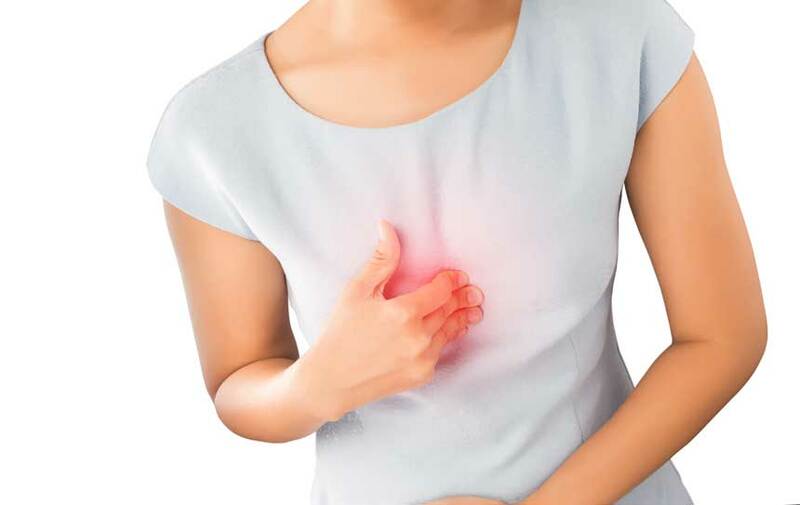 Gastroesophageal reflux (GORD) occurs when acid contents from the stomach flow into the lower aspect of the oesophagus (food tube connecting the mouth to the stomach). Most people experience the reflux symptoms from time to time but some people may have very frequent symptoms that can affect their life. The backflow of stomach acid contents to the oesophagus is normally controlled by a circular muscle. Factors that can relax or affect the workings of this muscle (hiatus hernia, connective tissue disorder such as scleroderma), increased pressure inside the tummy or stomach (obesity, pregnancy, delayed stomach emptying, large meals, eating late at night) or certain types of food (fatty food, alcohol, coffee), medications (aspirin, calcium blockers) or chemicals (smoking) can promote acid reflux. sensation of sour liquid or a lump in the back of the throat. sometimes progress to precancerous changes to the oesophagus (Barret’s oesophagus). A careful history will be taken and you will be examined. Investigations will be directed towards excluding any other serious pathology depending on your symptoms and their severity and tests to confirm the diagnosis. These tests may include blood tests, an oesophagogastroscopy (OGD), oesophageal manometry with pH monitoring of your oesophagus and a contrast swallow x-ray where x-rasy are taken while you swallow a liquid that coats the lining of your oesophagus and shows up on x-ray. Most people with mild symptoms should be able to improve their symptoms with lifestyle adjustments avoiding factors that can make reflux worse as described above. Medication can also be used to neutralise the acid such as gaviscon or stronger medication used reduce or block the amount of acid produced by the stomach. In patients with persistent severe acid reflux, in patients that do not want to take long term anti-acid medication or in patients with a hiatus hernia a keyhole (laparoscopic) surgical procedure called fundoplication can be performed. The most appropriate treatment option will be discussed with you at an individualised basis.